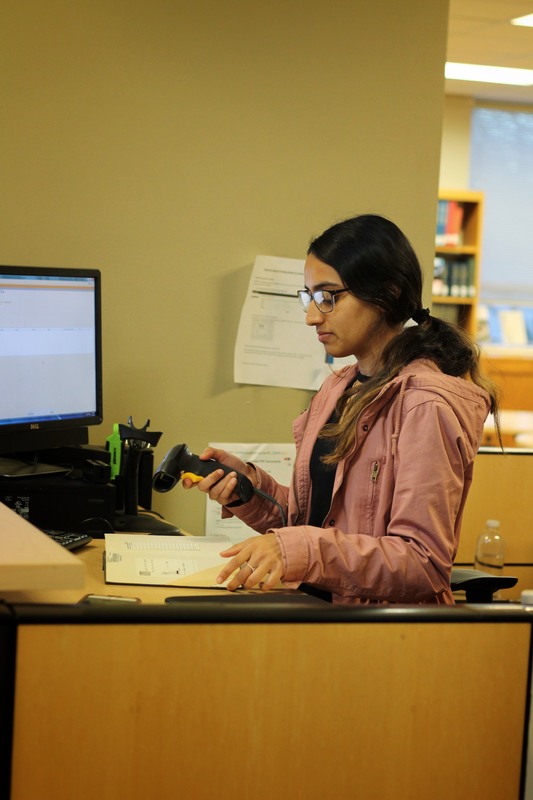 Student worker manning the front desk of the library. Photo courtesy of Claire Dooley. The college’s budgeting system is changing this semester—which will affect how student workers are paid. In the past, departments have paid their workers individually, but going forward students will be paid according to what the administration calls a “tiered” system. Carla Sarkady, human resources assistant, said there are three tiers student workers will fall under. “One is minimum wage jobs, then you have got all the different positions that fall under that tier, then you’ve got special skills jobs, and you have ones that fall under there, and then highly technical, and there’s certain ones that fall under there,” she said. These three tiers, minimum wage, special skills and highly technical jobs are intended to cover all on-campus jobs, with each falling into a different skill, and thus a different pay category. This is to prevent issues such as one department paying an office assistant minimum wage, while another pays an assistant doing the same job $9.00 an hour. “It’s all going to put them…together, and make [student payroll] uniform,” Sarkady said. This new system was put in place this past fall semester but did not come without concerns from students. One such concern was for students that rely on the money they make through their campus job, which could be lowered significantly in the tiered system. Mariah Stewart, a senior biology major employed by the Athletics Opportunity Club as a tutor for student-athletes, said that although she was not concerned about her pay changing, she was concerned for other, less fortunate students at Millsaps. “If [a student is] using a job here on-campus as their main source of income, then [the change] would greatly affect how they function,” Stewart said. Under the new system, there is a chance that jobs where students previously made a certain amount of money will have their salaries cut. However, the tiered system will still allow for a bit of leeway for departments. “If you have any students that you promised a wage to that does not fall under these tiers, let us know and we will honor it this year.” Sarkady said about the policy for returning students in the 2017-2018 year. This new policy will protect the wages of returning students through the end of the spring semester. However, in the 2018-2019 school year, the only increase will be a one-time $0.25 increase for a student returning to a job. The intent of this is to promote returning workers, though it seems that the standardization of student payroll may change things for many students.